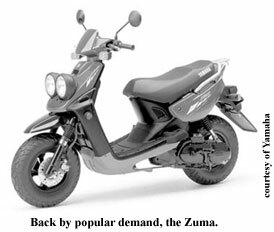 Yamaha is bringing back the Zuma for the 2008 model year “by popular demand.” One of the big 4 have stepped up to show that the 2-stroke scooter is not dead yet. The 2008 Zuma will be showing up in dealer’s showrooms in August with a new emissions control system and modified carburetor settings to pass the 2006 emissions standards. Expect it to be slower than the pre-emissions models, but take comfort in knowing that there are tons of hop-up goodies available when the warranty runs out. The metal-bodied, automatic Lambretta that I have been talking about for over a year now is no closer than it has ever been. But that doesn’t mean that we won’t be seeing a plastic bodied, automatic Lambretta soon. Apparently the person who owns the Lambretta name in the US will be selling re-badged Adly scooters under the Lambretta International. The first 2 models to be sold will be the Uno and the Due. One is a sport styled, 150cc 4-stroke, and the second is a more radical looking 50cc 2-stroke. Adly is a second tier Taiwanese scooter manufacturer. While the quality of their product is higher than the Chinese manufacturers, it is really disappointing for me to see the storied Lambretta name slapped on a product with no regard for its history. What do 400 scooters look like streaming through Minneapolis? Find out at the 8th edition of the Twin Cities scooter rally, Rattle My Bones, taking place August 16th- 19th. Follow the trail of 2-stroke smoke to the different venues around Minneapolis and St. Paul that will be hosting parts of the rally. Friday Night will be at the Triple Rock Social Club on Cedar Ave. in Minneapolis, and will feature many scooter friendly bands. They will also raffle one or two of the THREE scooters that have been donated by the rally sponsors! Saturday afternoon is the BIG ride and Saturday Night will be hosted by Grumpy’s on Washington Ave., in Minneapolis. There are events planned to fill the entire weekend. Check Rattlemybones.com to get all of the details and to pre register. Piaggio’s red headed stepchild, the MP3, has just gotten a bit bigger and meaner. Piaggio USA announced that the 400cc version of the three-wheeled scooter will be coming to the US in the near future. Sweet. It seems like you can’t swing a dead cat around without hitting a story about gas prices and people buying scooters. I think every local news station has already covered it. Dave H. at justgottascoot.com put together a spreadsheet to compare a scooter vs. a car to see how long it would take on gas savings alone to pay off a new ride. Looking at the Buddy 125, which sells for $2700 and gets at least 85 mpg, it would take me and my driving habits over 5 years for the scooter to pay off in just gas savings. It is not too surprising that it would take that long for a scooter to pay for itself. But if gas prices are going to be the excuse that finally convinces the hesitant spouse to concede to a new ride, then by all means, use it.